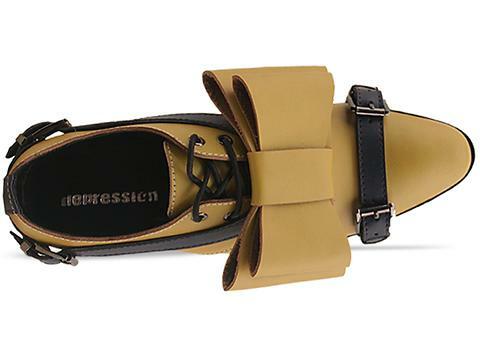 Today's So Shoe Me is the Transformer Shoes Bow Oxford by Depression, $195, available at Solestruck. 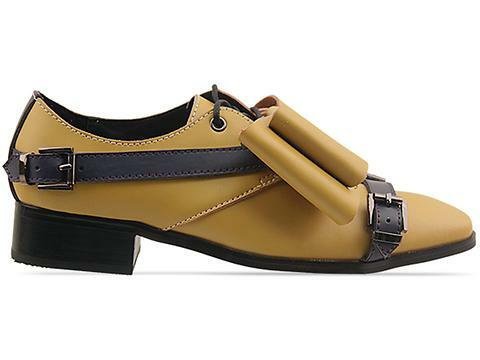 A mega-feminine bow meets a fetishist's fantasy in this buckled and strapped oxford that's a harness-ity for all four seasons. The rich mustard yellow and warm grey accents add a modern color combo that can be worn as a pop of color or a new neutral. The oversized bow sprinkles a contemporary dose of glam while the harness details and elongated square toe add an impactful edge. The slight block heel gives this oxford a refined finish and comfortable lift. Perfect for transitioning from winter to spring there are endless ways to style these bowed beauties. Pair these shoes with some matching mustard tights, a statement skirt, thin crop top and fun fur jacket for a dressed up yet comfy winter look. So shoe Me a pair of elongated oxfords that will add a feminine bow and edgy harness details to my everyday winter style.